Pictured (right) is John J Audubon’s illustration of the Rough Legged Buzzard, today commonly referred to as the Golden Eagle. This hand-colored lithograph is Plate #12 from the Octavo Edition of Birds of America – created from 1840 to 1844. “The Golden Eagle, although a permanent resident in the United States, is of rare occurrence, it being seldom that one sees more than a pair or two in the course of a year, unless he be an inhabitant of the mountains, or of the large plains spread out at their base. I have seen a few of them on the wing along the shores of the Hudson, others on the upper parts of the Mississippi, some among the Alleghanies, and a pair in the State of Maine. At Labrador we saw an individual sailing at the height of a few yards, over the moss-covered surface of the dreary rocks. Although possessed of a powerful flight it has not the speed of many Hawks, nor even of the White-headed Eagle. It cannot, like the latter, pursue and seize on the wing the prey it longs for, but is obliged to glide down through the air for a certain height to insure the success of its enterprise. The keenness of its eye, however, makes up for this defect, and enables it to spy, at a great distance, the objects on which it preys; and it seldom misses its aim, as it falls with the swiftness of a meteor towards the spot on which they are concealed. When at a great height in the air, its gyrations are uncommonly beautiful, being slow and of wide circuit, and becoming the majesty of the king of birds. It often continues them for hours at a time, with apparently the greatest case. The nest of this noble species is always placed on an inaccessible shelf of some rugged precipice;–never, that I am aware of, on a tree. It is of great size, flat, and consists merely of a few dead sticks and brambles, so bare at times that the eggs might be said to be deposited on the naked rock. They are generally two, sometimes three, having a length of 3 1/2 inches, and a diameter at the broadest part of 2 1/2. The shell is thick and smooth, dull white, brushed over, as it were, with undefined patches of brown, which are most numerous at the larger end. The period at which they are deposited, is the end of February or the beginning of March. I have never seen the young when newly hatched, but know that they do not leave the nest until nearly able to provide for themselves, when their parents drive them off from their home, and finally from their hunting grounds. A pair of these birds bred on the rocky shores of the Hudson for eight successive years, and in the same chasm of the rock. Their notes are harsh and sharp, resembling at times the barking of a dog, especially about the breeding season, when they become extremely noisy and turbulent, flying more swiftly than at other times, alighting more frequently, and evincing a fretfulness which is not so observable after their eggs are laid. They are capable of remaining without food for several days at a time, and eat voraciously whenever they find an opportunity. Young fawns, racoons, hares, wild turkeys, and other large birds, are their usual food; and they devour putrid flesh only when hard pressed by hunger, none alighting on carrion at any other time. They are nice in cleaning the skin or plucking the feathers of their prey, although they swallow their food in large pieces, often mixed with hair and bones, which they afterwards disgorge. They are muscular, strong, and hardy, capable of bearing extreme cold without injury, and of pursuing their avocations in the most tempestuous weather. A full grown female weighs about twelve pounds, the male about two pounds and a half less. This species seldom removes far from its place of residence, and the attachment of two individuals of different sexes appears to continue for years. They do not obtain the full beauty of their plumage until the fourth year, the Ring-tailed Eagle of authors being the young in the dress of the second and third years. Our north-western Indians are fond of ornamenting their persons and implements of war with the tail-feathers of this Eagle, which they kill expressly for that purpose. I conclude my account of this species with an anecdote relating to it given in one of Dr. RUSH’s lectures upon the effects of fear on man. During the revolutionary war, a company of soldiers were stationed near the highlands of the Hudson river. A Golden Eagle had placed her nest in a cleft of the rocks half way between the summit and the river. A soldier was let down by his companions suspended by a rope fastened around his body. When he reached the nest, he suddenly found himself attacked by the Eagle; in self-defence he drew the only weapon about him, his knife, and made repeated passes at the bird, when accidentally he cut the rope almost off. It began unravelling; those above hastily drew him up, and relieved him from his perilous situation at the moment when he expected to be precipitated to the bottom. The Doctor stated that so powerful was the effect of the fear the soldier had experienced whilst in danger, that ere three days had elapsed his hair became quite grey. FALCO FULVUS, Bonap. Syn., p. 25. 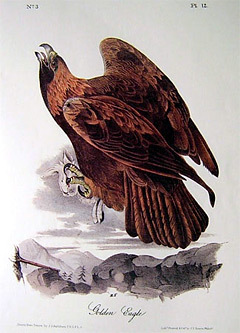 AQUILA CHRYSAETOS, GOLDEN EAGLE, Swains. & Rich. F. Bor. Amer., vol. ii. p. 12. RING-TAILED EAGLE, Falco fulvus, Wils. Amer. Orn., vol. vii. p. 13. ROYAL or GOLDEN EAGLE, Nutt. Man., vol. i. p. 62. GOLDEN EAGLE, Falco Chrysaetos, Aud. Orn. Biog., vol. ii. p. 464. Wings long; the fourth quill longest, the third almost equal, the second considerably shorter, the first short; the first, second, third, fourth, fifth, and sixth abruptly cut out on the inner webs; the secondaries long, broad, and rounded. Tail rather long, ample, rounded, of twelve broad, rounded, and acuminate feathers. Bill light bluish-grey at the base, black at the tip; cere and basal margins yellow. Eyebrows and margins of the eyelids light blue; iris chestnut. Toes rich yellow; claws bluish-black. Fore part of the head, cheeks, throat, and under parts deep brown. Hind head, and posterior and lateral parts of the neck light brownish-yellow, the shafts and concealed parts of the feathers deep brown. The back is deep brown, glossy, with purplish reflections; the wing-coverts lighter. The primary quills brownish-black, the secondaries with their coverts brown, and those next the body more or less mottled with brownish-white, excepting at the ends; the edge of the wing at the flexure pale yellowish-brown. Tail dark brown, lighter towards the base, and with a few irregular whitish markings, like fragments of transverse bands; its coverts pale brown, mottled with white at the base, and paler at the ends. The short feathers of the legs and tarsi are light yellowish-brown, each with a dark shaft; the outer elongated feathers dark brown; the lower tail-coverts light yellowish-brown. The base of the feathers on the upper parts of the body is white, on the lower pale dusky grey.